Specializing in Bridal, Fashion and Events Henna. NOTE: we mix our own henna fresh, weekly! no chemicals or preservatives. Now offering: White Henna, Washable Henna, Metallic/Glitter Henna and Jagua - looks like a real tattoo! Bridal | Parties/Events: Birthdays, Bachellorette parties, etc. | Charities, festivals and Socials | Holidays: Eid, Garba, Diwali etc. | and any merry occasion! Great experience! Naza was professional yet personable. Excellent attention to detail. I would definitely go back to her for future occasions. 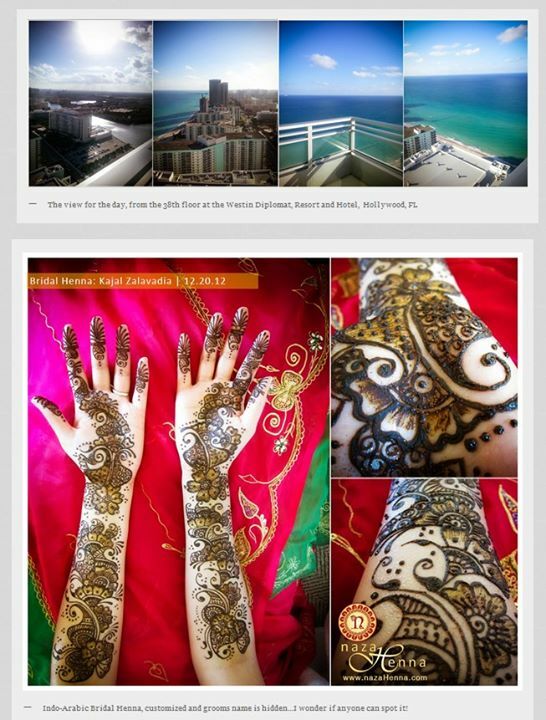 Nazha was professional and charming...she initiated getting guests throughout party to come and get a henna tattoo. The hennas were beautiful and the guests enjoyed them. --kim h.
Thank you so much for having us! It was a pleasure and your decor was so cool! hope to work with you again in the future. I've had my henna done by Nazha a few times and each time people have alwas stopped me admiring her work and asking where i got my henna doe. She is SO CREATIVE and a pleasure if a person. If i could i'd give her 5 thumbs up instead of 2!! Wonderful artist and all around person! Now i'm hooked and always am thinking of my next one with her. You won't be sorry!!! I have had henna done a few times with Nazha and every single time I was more pleased than the last! She is very professional and I still remain in awe on how she freehands the henna and it comes out perfect every time. She is truly an artist in every sense of the word! Borne from the desire to create art and beauty in all aspects of life, nazaHenna’s main purpose is to passionately adorn each client with organic traditional henna body art. Specializing in South Asian weddings, our goal is to provide the richest and darkest stain possible using the finest quality ingredients as provided by Mother Nature herself. Along with crafting intricate designs and embellishments fit for a Maharani (Queen), we strive to provide an all-encompassing service that both pampers and nurtures the client’s spirit and senses. A bride in the Far East once said, “the darker my Mehndi the more he shall love me.” And so it began: the love for Mehndi and Mehndi for love. As fine artists we've embraced all styles of henna and continue to develop and grow. 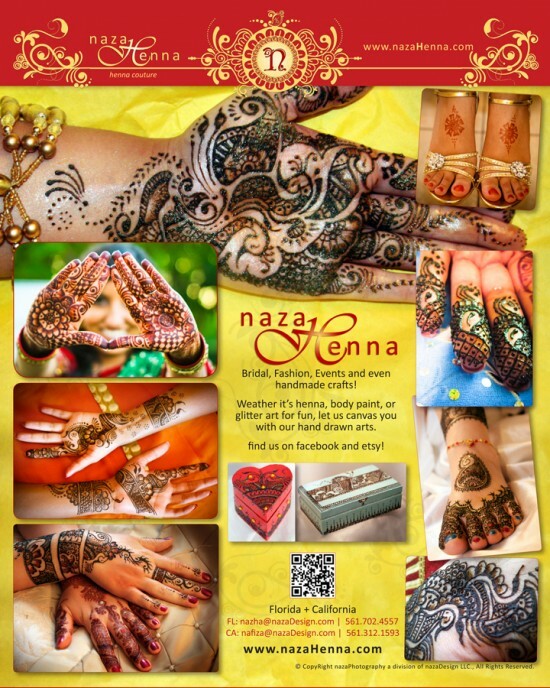 We specialize in traditional bridal henna, contemporary, modern and fashion henna. We also offer Jagua Henna, organic products, embellished apparel and much more. 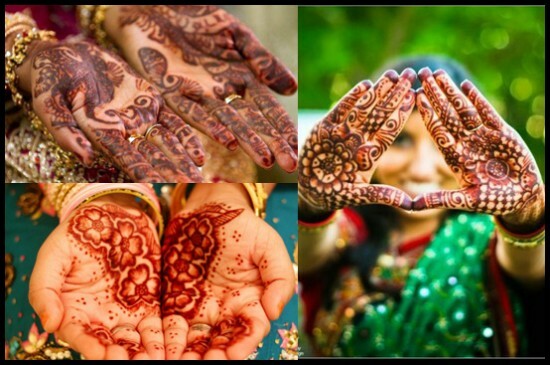 As south Asians ourselves, we continue to value the traditions and values of henna, and strive to provide that passion, love and freshly handmade Mehndi to each and every client. 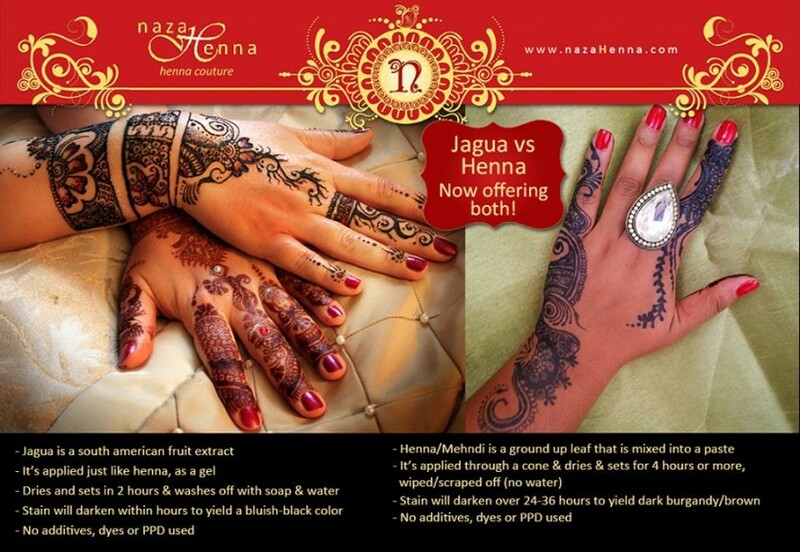 WE DO NO USE BLACK HENNA! -- see FAQ on our website for more info. our henna is ORGANIC and freshly made, safe and we do share our ingredient list so you may use discretion, ensuring there are no allergies. How Long does it stay on the skin? After the henna is applied, it should be kept on for 3-6 hours. Some people choose to keep it on overnight. Weather, body temperature, pH levels and other elements may affect the stain, no two persons are alike! Generally, the longer the henna remains on your skin, the darker/longer the stain will be and last. After several hours, the henna is scraped off, leaving a bright orange stain on your skin, this color will oxidize over the course of 36 hours, changing to a deep burgundy, red-brown color. The final stain will fade over the course of 1 to 4 weeks, depending on the area and how often you wash it or expose it to the elements. Henna stains the dead skin only, especially in callused areas, so you'll always find your best color on palms and soles. -- which is why its our favorite areas to doodle! Where can henna be applied? Henna is used traditionally for decorations on hands and feet, but can be applied anywhere on your skin or hair. The stain lasts longest and is darkest on the palms of the hands and the feet. If applied on the hair it dyes it to a reddish-brown color, even on black hair it gives a shimmer and highlight.